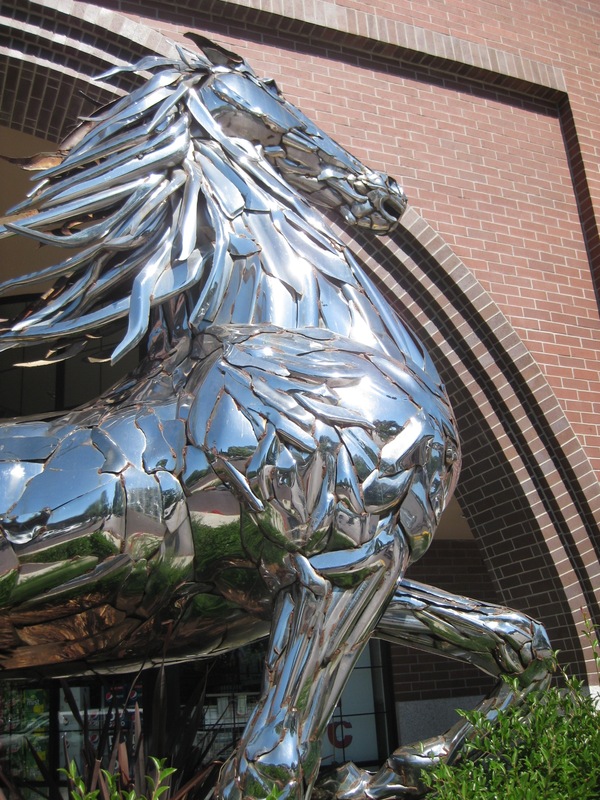 This chrome sculpture is an 11-foot tall, 2,500 lb imposing piece of art that dominates the front entrance to Safeway of all things. It is a strange beast. I admit my own intrigued but ambivalent feelings toward this shopping center art. After learning more about the artist, Sean Guerrero (aka The Bumper Hunter), and his work I have more intrigue and less (but still some) ambivalence. 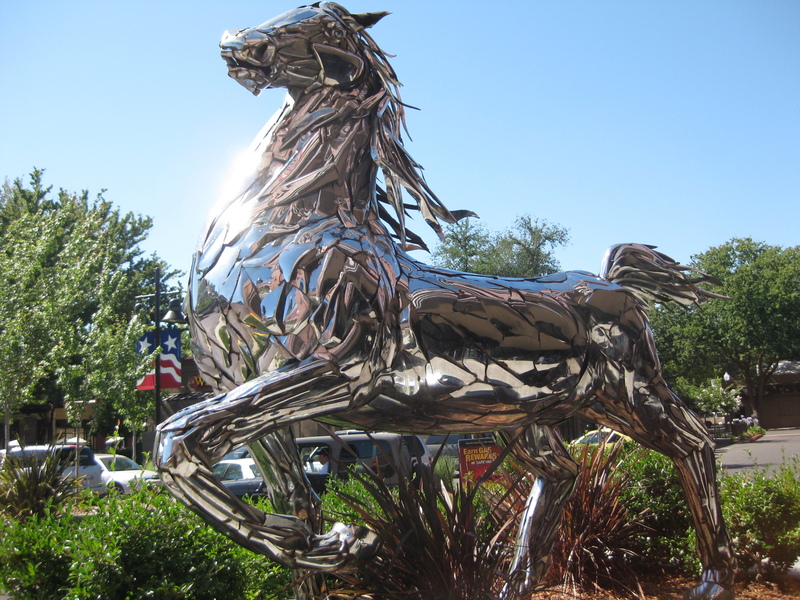 The horse was commissioned by local developer, Paul Petrovich, who is quoted saying “Retail is about life and energy. . . . His art adds lots of energy.” (2) Retail is not about life to me, but Guerrero’s work definitely adds energy. I’ve seen some of Guerrro’s other work and it conveys to me the intensity and power I think he is seeking to convey. 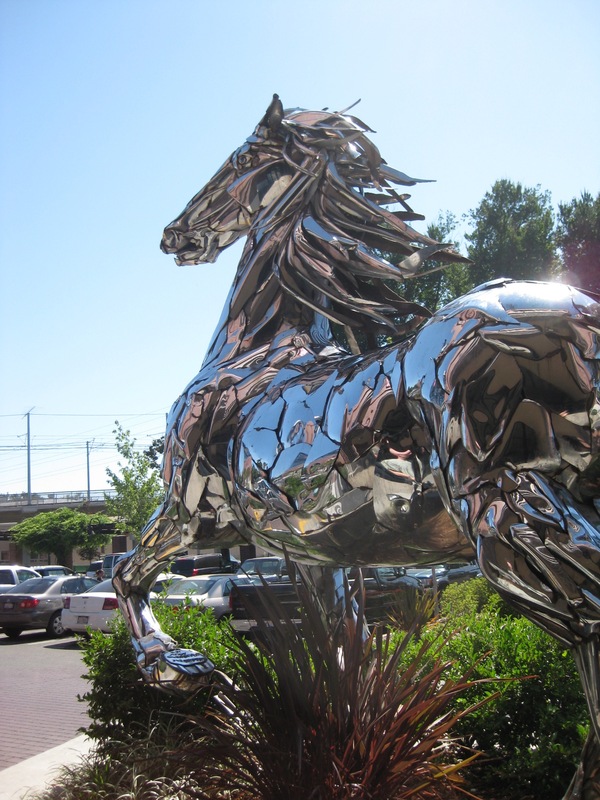 His pieces do feel like resurrections of the big chrome bumper car beasts, and the horse lover in me is drawn to what he captures in this piece. I suspect that part of my ambivalence comes from how these pieces evoke the myths of Westerns and the American Dream for me. I am aware of the problems those myths perpetuate so it is difficult to surrender to the images/feeling of the art. Part of the value of art is making us stop to reflect on these things, regardless of the degree to which we “like” the images or not. I pulled into the Safeway Parking lot in the first open space. I opened up my door and nearly froze looking up at the stallion. Im 44 years old, I cant think of any piece of art that has impacted me and caused me to forget where I was, who I was with, and what I was there for. I love this Horse so much that if I wasnt fat, I would have risked climbing on top for a picture. It you would have made the front left foot just a tad lower….Who knows? Im kidding, I wouldnt want to scratch it or damage it in any way. I to the core of my being love this horse. Thank you for creating it. Stunning would be a severe understatemnet. Much love…Thank you for sharing your talent.